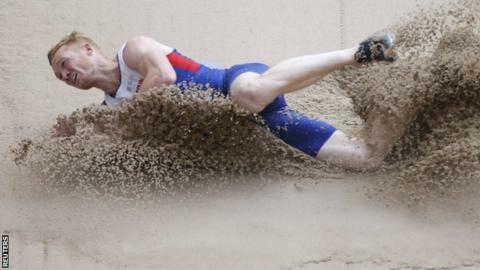 Britain's Olympic long jump champion Greg Rutherford has been advised to "do more jumping and less talking" by sprint great Michael Johnson. London 2012 gold medallist Rutherford, 28, competes in Tuesday's final at the World Championships in Beijing. On Monday he criticised what he called "class systems" in UK Athletics. "Rutherford makes a lot of inflammatory comments but there isn't a lot of explanation behind those," Johnson told BBC Radio 5 live. "So it's hard to know what's prompted him to make those comments." Rutherford says he has not received enough support from UKA and also used Twitter to admonish the governing body for omitting the British flag from the team vests for Beijing. He also said Johnson had been "out of order" for his critical analysis of Katarina Johnson-Thompson's failed attempt to win a heptathlete medal. "He may want to look at why he hasn't been able to benefit from being an Olympic gold medallist at home," said Johnson, who is an eight-time World Championship gold medallist. "He may find that some of it has something to do with some of these comments he makes. "If you have a problem with UKA, Twitter is not the place to deal with that and I think he has to learn that. Now's not the time to be focused on UK Athletics - do more jumping, less talking." The greatest female sprinter ever? Jamaica's Shelly-Ann Fraser-Pryce, 28, claimed her sixth World Championship gold medal and back-to-back 100m titles on Monday. The two-time Olympic champion, who is the fourth-quickest woman of all time, is a year younger than her compatriot Usain Bolt. "Were it not for her career coinciding with Bolt's, I think she would be a lot bigger than she is," said four-time Olympic champion Johnson. "She's an amazing athlete, a great person and is highly revered in Jamaica. She's a great champion and very humble. "And given the titles she has won you would have to say she is the greatest female sprinter of all time." American Justin Gatlin, runner-up to Bolt in the 100m in Beijing, will refuse to talk to British media after his agent said the sprinter had been "vilified". Gatlin's main grievance is that he is often referred to as a two-time drugs cheat. His first drugs ban in 2001 was reduced from two years to one after he proved the amphetamines he was taking were for an attention deficit disorder. After winning the 100m and 200m double at the 2005 Worlds in Helsinki, the 33-year-old then tested positive for testosterone in 2006. He served a four-year ban that had been twice reduced from a lifetime and eight years. "Nobody in the UK has any interest in listening to any of his argument. He is enemy number one here," said Johnson. "But if you wanted to dig deeper into the situation, he had been diagnosed with attention deficit disorder earlier in his life and had been taking that drug for 10 years and did not declare it when he was at university. "They minimised his ban because when they looked they could see it was prescribed for most of his life. Nobody has any interest in hearing that and he has to understand that."